1. Review the Exhibitor Manual with your show staff. 2. Place orders for show decorator services (carpet, table, chair rental, etc) and utilities prior to the show (see instructions below on ordering power, water, internet, etc). 3. Review the Move-In, Show, and Move-Out hours with your team (scroll down for dates/times below). 4. Go over the MUST DO Checklist to ensure your booth and staff are show ready. 5. Contact us with questions; we're here to help you have a great show! Everything you need to know about move-in, move-out, booth regulations, and more! Order your booth carpet, chairs, tables, and more! Reminder: Flooring is required in all booths. Tables must be skirted to the floor. This network is for Exhibitors ONLY! Do not share password with attendees. They have the option of using the free public network STATEFAIRGROUNDSPUBLIC which requires no password and limits their connection time. The cost of basic electric is included with each booth space, but you need to request activation. Please email Erin Calabritto at erinc@mpeshows.com no later than Friday, March 22nd to request electrical service. Electrical services can be ordered at the show office in the Jim Graham building on-site during move-in, but will likely result in a longer wait time for activation. Print and use these to collect leads at the show. Are you looking for a way to get a leg up on the competition, stand out from the crowd, drive booth traffic, or create awareness? We have affordable options! Exhibitor Seminar PowerPoint: Tips & Tricks for Your Best Show Yet! By request, here is the PowerPoint presented at our recent Exhibitor Training seminar. All food sales and related sampling must be approved by the NC State Fairgrounds and Marketplace Events. Concession style food service is not permitted (prepared foods that can be consumed immediately). Pre-packaged food and beverages (candy, chips, bottled water, etc) may not be given out as promotional items. Pre-packaged food and beverages (packaged for preparation and consumption at a later time) may be sold and sampled, pending approval of the NC State Fairgrounds and Marketplace Events show management in accordance with the guidelines below. Email ErinC@mpeshows.com if you plan to sample or sell any kind of food or beverage no later than March 22, 2019 for review, approval, and sampling guidelines. *Drive-in access ends Thursday at noon to allow exhibitors with booths located in front of freight doors time to set up. All exhibit booths must be set up by 5pm on Thursday; there is no setup allowed on Friday morning. Please note, there is no longer a "Preview Night" on Thursday. Hours subject to change. Friday, April 5, 2019 10:00 a.m. - 8:00 p.m.
Saturday, April 6, 2019 10:00 a.m. - 8:00 p.m.
Sunday, April 7, 2019 11:00 a.m. - 6:00 p.m. Please note, the show floor in both buildings must be clear of all exhibit booths, materials, and vehicles no later than 3pm on Monday or you may be assessed a cleanup fee. HAVE YOU SET UP YOUR EXHIBITOR LISTING? Free and unlimited. You may park vehicles around the Expo Center and Jim Graham Buildings in the regular parking areas (all are uncovered lots, mix of gravel, paved, and grassy areas). Trailers and box trucks may be parked on the Southwest side of the Jim Graham Building, downhill on the gravel lot towards the corner of Hillsborough St and Youth Center Blvd. 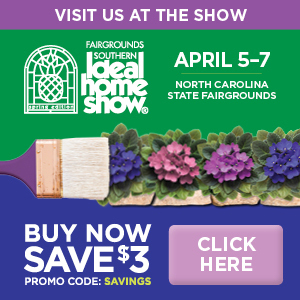 Click here for a copy of the official Show Guide that will be distributed to the entire circulation of the News & Observer the Sunday prior to the show as well as available on-site (at the entrance to the show in the Exposition Center). Deadline to book your booth space to be included in the printed Show Guide is Friday, March 1, 2019. We have four categories with one award each. Awards are determined by show management. We take many things into consideration when deciding on award recipients, including but not limited to: overall contribution to the quality of the show, social media sharing, promoting attendance through distributing complimentary tickets, booth display quality, adherence to show regulations, and more. Awards are issued by Saturday of the show. Best of luck and thank you all for putting your best effort into making the Southern Ideal Home Show an outstanding experience for our consumers! Please note, the Hampton Inn closest to the NC State Fairgrounds is currently under remodeling/construction. Amenities: Spacious modern guest rooms designed for the business traveler with in-room safes. FREE Deluxe Continental Breakfast daily with hot items available. FREE Manager’s Social with Beer, Wine and hors d’oeurves: Monday- Thursday 5pm-8pm. FREE Wired and Wireless Internet. 24 Hour Courtesy Shuttle to and from RDU Airport. Courtesy Shuttle within 5 mile radius of the hotel to local businesses. On-site Business Center. 24 Hour fitness center with PreCor equipment and free weights. Indoor heated pool with Whirlpool. Each guest room has a refrigerator, microwave, laptop capable safe and a 42” flat screen TV. Amenities: Oversized suites with sitting area, dry bar and an attached King or Double sleeping room. Each suite features State-of-the-art media and work center, high definition 42” plasma television that integrates with laptops and other electronic devices, a video and music entertainment system, plush Hyatt grand bed, and upgraded bathrooms with granite vanity area. Complimentary parking for individuals and buses, complimentary high speed wireless internet service, complimentary hot breakfast buffet, complimentary fitness center and outdoor swimming pool, personal voice-mail, Hyatt Gold Passport Points. The hotel offers complimentary parking for 400 cars, saving up to $18.00 per day, complimentary transfers to and from RDU airport, saving up to $55.00 for your guest and the hotel is Recipients of the 2013 JD Powers & Associates Hotel Guest Satisfaction Award for Best Upscale Property. Amenities: Newly renovated 100% non-smoking, spacious rooms equipped with cook tops with granite counter tops (all utensils supplied), HDTV, full size refrigerator, complimentary free hot breakfast daily, WI-FI, weekly evening social hour – Monday through Wednesday 5:00 PM to 6:30 PM, 24-hour business center, workout area, and laundry facility. Amenities: Complimentary hot breakfast buffet for guest, complimentary wireless internet, 24 hour deluxe business center, full service restaurant and lounge, room service, outdoor pool, fitness center, 100% non-smoking rooms, pet rooms available upon request, based on availability ($25 pet fee per stay).